Katie-George Dunlevy and Eve McCrystal have defended their world title in the Time Trial at the UCI 2018 Para-cycling Road World Championships in Maniago, Italy today. The Paralympic Champions finished the 27.7km Time Trial in a time of 35:26:37, seventeen seconds ahead of silver medalists Lora Fachie and Corrine Hall from Great Britain. Poland’s Iwona Podkoscielna and Aleksandra Teclaw rounded off the podium two minutes further afield. Speaking after the race an elated Dunlevy described a technical hard course – “It was quite technical in the first part, and hard to stay on the power. In the straight sections we just got on the power together. 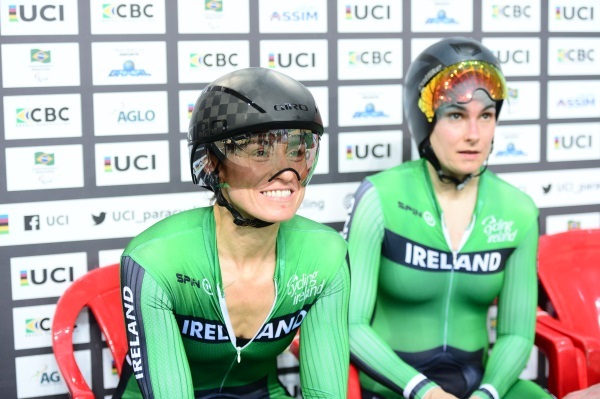 Pilot Eve McCrystal added that “it’s always hard to win a world title, but to defend it is even harder. We were told after one lap that we were ten seconds down – and we went on to win by almost twenty seconds. I knew our form was good going into it, and at this stage we have such confidence in each other. “It’s been great getting opportunities to race with other pilots and have different experiences, and it’s good to maybe not be winning all the times – and to be getting races! In the Men’s B Tandem Time Peter Ryan and Sean Hahessy had a fantastic ride to finish in seventh place with a time of 32:42:56 – just over a minute behind world champions Great Britain. Damien Vereker and Dermot Radford were a further minute back in 12th place with 33:45:54. Ronan Grimes finished 12th in the Men’s C4 Time Trial with a time of 38:24:69 and Colin Lynch was also 12th in the Men’s C2 Time Trial with 19:59:01. Tomorrow the attention moves to the Road Races, with Declan Slevin competing in the Men’s H3 race. The Paracycling Road World Championships run from the 2nd – 5th August.